From Bachelor/Bachelorette parties to Corporate Team-building; school field-trips to birthday parties and more, Forteza is ready, willing and able to provide you an inspirational experience with the historic arts of the rapier, longsword, quarterstaff, and more, in our beautiful, one-of-a-kind facility. Here are just a few examples of the diverse events we can accommodate. Married life is its own challenge, can you handle ours? Every best man and maid of honour is looking for the wow-factor to make their best friend’s last single bash the greatest and most memorable ever. Swordfighting provides a physical and mental challenge and an experience that will be talked about around every anniversary for years to come! Learn the basics of movement, posture, attack and defence in fun interactive games that get everyone involved. 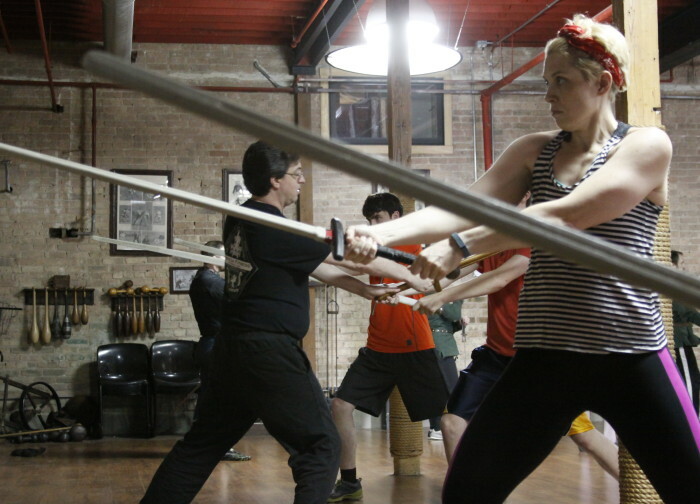 Try out the arts of the rapier, longsword, sword and shield, quarterstaff and more. Handle real swords and armour in your class and in our interactive museum. Put the bride or groom to be in armour and give them a chance to show off what they’ve learned against the entire wedding party! For more information or to book a day and time, please e-mail info@fortezafitness.com, subject: Bachelor Party or phone us during business hours at (773) 271-3988. Give your child an unforgettable birthday! Transport your whole party back in time as they learn to the art of the rapier, longsword, quarterstaff and all manner of knightly and renaissance skills. Our studio, which includes an interactive arms-and-armour museum, will provide a safe, exciting, and fun environment for kids and parents alike. Programs are available for kids aged 6 and up and parents are allowed to join in. We ask that the birthday package have a minimum of 6 children participating and a maximum of 20. Our basic package features one hour of longsword instruction and one hour of cake and present time in our facility (food not included). Cost: $250. If you’d like to book a birthday party for your child, please e-mail info@fortezafitness.com, subject: Youth Birthday or phone us during business hours at (773) 271-3988. We recommend a minimum of 2 hrs for a field-trip or school visit, although for summer camps and teens we can do three, four or five hour workshops. Prices start at $300, and includes any and all equipment needed. If you’d like to book a field trip, please e-mail info@fortezafitness.com, subject: Field Trip or phone us during business hours at (773) 271-3988. 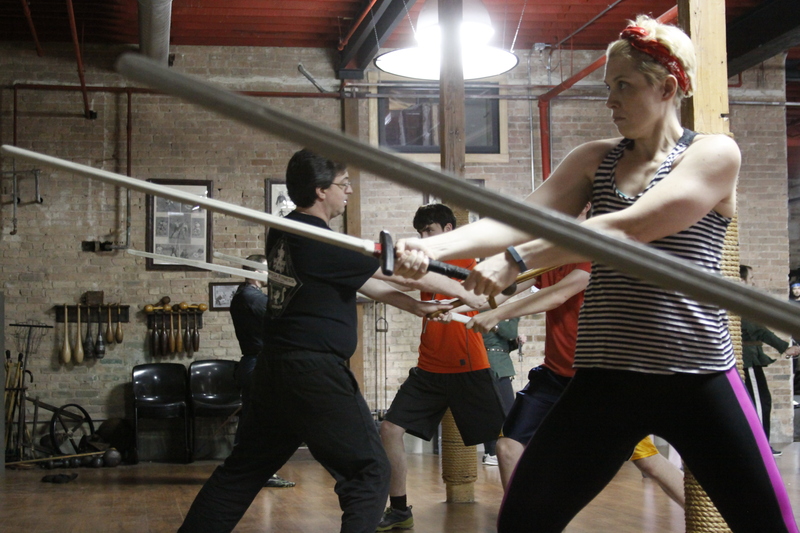 Swordplay is one of the most exciting ways you can improve fitness and mental health while building each team member’s individual strengths. Help build your team and connect with history, while they increase their fitness, become more cohesive, and resolve workplace stress – all while having a great time. Our corporate programs range from one-hour to all-day workshops, regular fitness sessions, and exciting performances. Join us at our 5000 sqft. studio, or invite us out to your office for a single session or an ongoing lesson or fitness series. 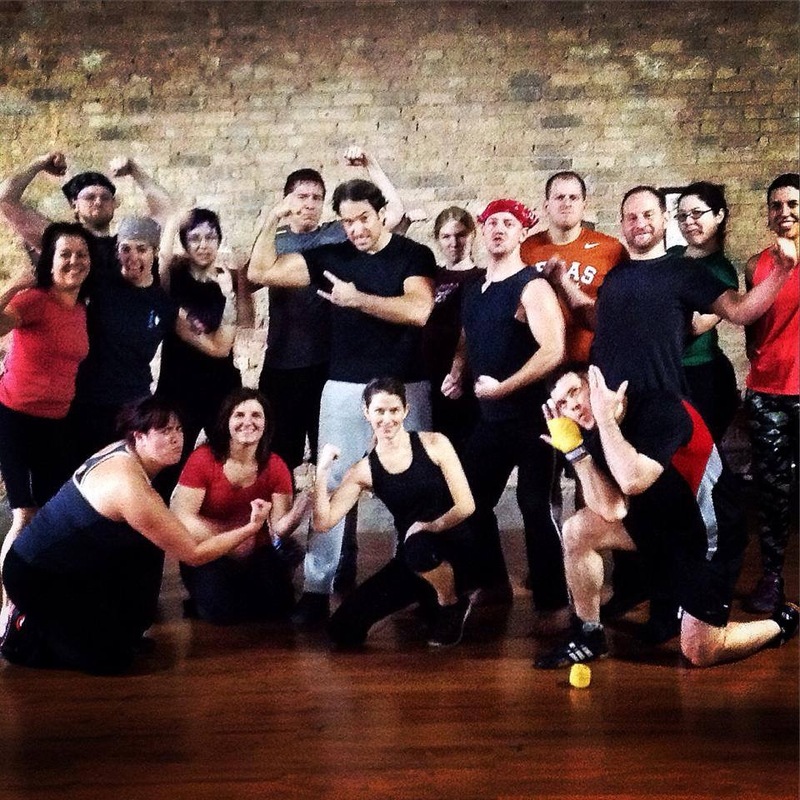 If you’d like to book an event for your team, please e-mail info@fortezafitness.com, subject: Corporate Training or phone us during business hours at (773) 271-3988. All special event training is conducted under the eye of experienced instructors. We use special blunted practice swords or nylon/padded weapons (as appropriate to topic and audience) and anytime we are doing contact striking we use safety equipment made for comfort and protection. All exercises are done with control and respect in a fun and engaging environment. As with any physical activity there is some risk of injury. Participants with existing health problems should inform the instructor before training.